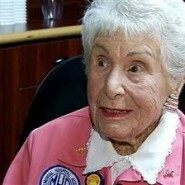 Home » Inspiration » 105-Year-Old Mrs. Noyek is Still Volunteering! 105-Year-Old Mrs. Noyek is Still Volunteering! inspirational. we can keep on giving and living.